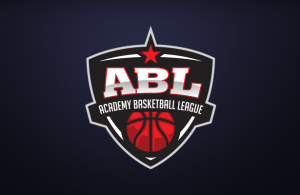 With the first round of the Academy League playoffs completed, we took a look back at the ABL Quarter Finals to see which teams made it through to the Final 4’s next week! 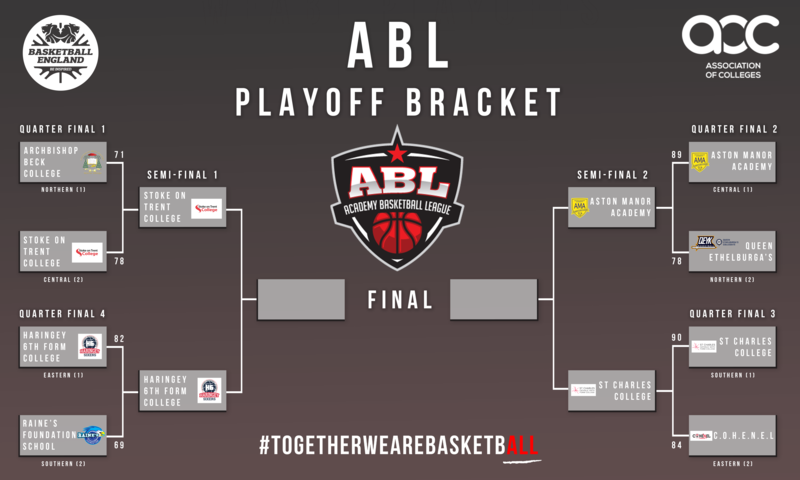 The #1 seed from the Northern Conference, Archbishop Beck faced Central #2 Stoke on Trent at Archbishop Beck College in Liverpool on Wednesday afternoon. With a crowd of around 200 pupils it was a very exciting affair that went right down to the wire, with Stoke holding on to a 78-71 Victory. The first quarter saw Stoke playing their 2-1-2 and 2-3 zone for the majority of the time. Beck moved the ball well despite playing slightly apprehensively, but they soon settled down and poured in 24 points with a very balanced offensive output led by Phil Deveney with 6, and Ward and Dalton with 5. Stoke came out shooting extremely well, with Mike Jara connecting on two threes and Bayley Gaunt also connecting from the outside. In the second half, Archbishop Beck started slowly committing several early turnovers. Stoke on the other hand, set up some nice plays to get open looks against Becks 2-3 zone, with Jara converting on 3 threes, giving him 11 points for the quarter. Stoke outscored Beck 25-13 in the 3rd with good offence and some tough zone defence were they kept Deveney quiet with only 4 points, and forced Becks’ less confident shooters to take open looks from 3. Going into the final quarter Stoke led 67-54. The last quarter was a great battle with a lively home crowd rallying behind the home team who managed to fight back and cut the lead to 4 with only 2 minutes left to play after a huge 3 from Deveney and some clutch jump shots by Jacob Graham. Beck held Stoke to only 11 points in the quarter and ran their press well forcing Stoke into some costly errors. However, it wasn’t enough, as Stoke managed to hold on in the remaining minute after a crucial Beck turnover. Stoke then scored 3 of their last five points from the line and held on to win this exciting game 78-71. They will move on to the semi-finals next week where they will play Haringey Sixth Form College. 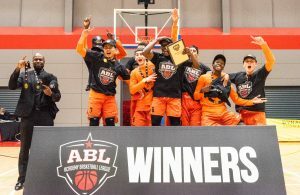 Aston Manor continued their march towards an ABL final appearance with an 89-78 defeat of Queen Ethleburga’s College on Wednesday afternoon. Zack Powell was the star man with a stat stuffing 26 points, 10 assist, 7 rebounds and 4 steals. The first quarter started as a tight affair with both sides trading baskets. Elijah Walsh (29 points) showed early on that he would be a thorn in the home teams side with a long three pointer but behind some great team play from Aston Manor, the home team pushed their lead to nine points going in 23-14 at the end of the first. The second quarter had Jedaiah Alexander hitting some big shots for Queen Ethelburga’s but Aston Manor replied with Zack Powell and Omari Smith (20 points) scoring freely and sharing all 23 second quarter points to go in 45-32 at the half. The second half saw both teams more or less trading baskets with QE’s captain Joe Barrett using his size to score under the bucket and Walsh hitting an impressive 6 three pointers. Aston Manor showed their depth with a solid overall team performance to close out the game 89-78, and booked their place in next weeks semi-finals where they face St.Charles College at home. Game 3: St.Charles College 90 v 84 C.O.H.E.N.E.L. St.Charles secure the win at home and book their ticket to the EABL Semi-Finals with a 90-84 win over COHENEL. St.Charles started the game with a 25-10 run and took advantage of a good shooting night as well as getting out on the fast break to score the majority of their points. The first quarter ended in a 25-15 lead to St.Charles. The 2nd period saw COHENEL’s defence pick up which made it hard for St.Charles to get any good looks at the basket. The 3rd quarter was a more closely contested game, with the score ending 19-18 in favour of St.Charles. In the third, both teams went on runs connecting from deep, and making some heavily contested shots which gave them the momentum they needed to carry out the victory. Haringey Sixth Form College progressed to the ABL Semi-Finals by defeating Raines Foundation School 82-69. Haringey made a strong start with some defensive pressure that led to some quick baskets, putting them up 12-0. However, Raines rallied back and were able to apply some pressure of their own to end the first half closely. The second half was a good battle and both teams had their moments but Haringey were the ones able to pull away in what was an entertaining game. Franklin Agu led Haringey with 24 points and 17 rebounds whilst Ndewedo Newbury added an impressive 21 points. Jason Prince had a strong performance for the visitors as he finished the game with 36 points. With the win under their belt, Haringey will travel to Stoke next week for their semi- final match-up against Stoke on Trent College. 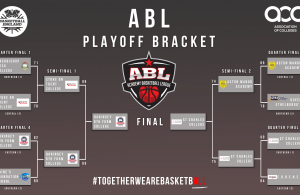 Next Story → PREVIEW: Semi-Finals get underway as the playoff journey continues!